Question: "I have a 3 piece leather suite with 2 recliners and a 2 seater sofa which is currently dyed a bright orangy terra cotta colour with a smooth shiny finish. I would like to change its colour by dyeing it. I assume that it would be safest to change to a similar colour such as mid-brown. Can it be done by me at home with a kit? Can you help please? Thanks!" Answer: This sounds like a job for a furniture restorer or re-upholstered. 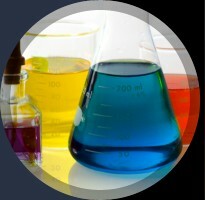 We supply industrial dyes for dyeing leather and skins in industrial machines. Good luck in your search. Question: "Can I say first that I am not a company, therefore you may not wish to reply - but I am desperately trying to get hold of a dye that will dye a 100% polyester garment black. Please could you advise of any company in the UK that sells such a dye as when I search on the internet I can only find scientific or Company only websites - I Am quite confused and any help would be greatly appreciated. Thanks for your time." Answer: "Sorry we only supply industrial dyes. Have you considered Dylon Dyes for home dyeing .They are available from good craft shops Woolworth's etc and can be used in a washing machine. Please also check out their web site at www.dylon.co.uk"
Question: "Please courier us your sample, technical data sheet of your Food Colours."